Early today Samuel Nkailu came to say goodbye. We have met him every day this week. He has come to unlock the door for us at the Youth House, and every day he has stayed for a while, listening to the training of the entrepreneurs. He is now 76 years old and it is 51 years since he first came to Sweden. At the residential college of South Vätterbygden, Lennart, Bernt and I went a year in the same class as him. Samuel has a positive disposition and appears to be in good health. 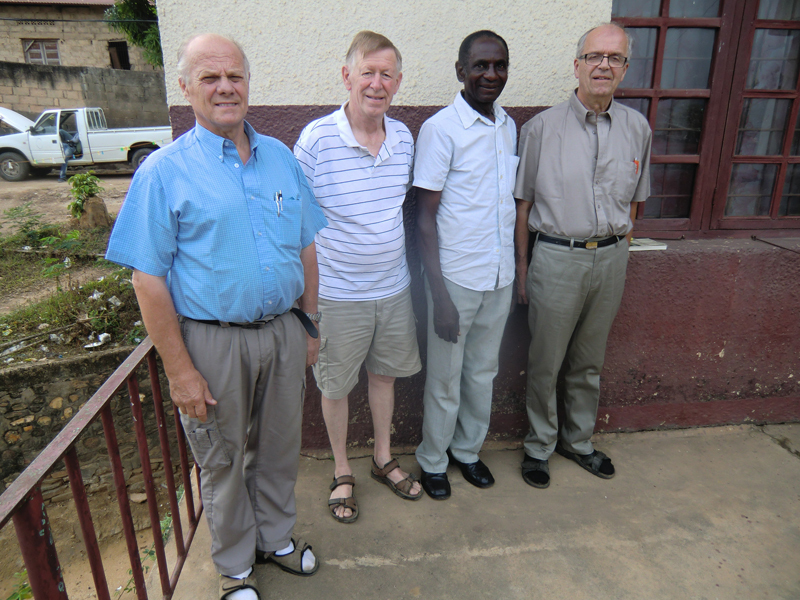 Bernt and Lennart have decided to together pay Samuel $ 30 per month because he takes care of the Youth House. The premises suits our activities very well. When we walked to breakfast Julienne picked up a windfall, a fruit called beef heart, in Kikongo Ntima Ngombe. The tree grows along our pathway. We had this particular fruit for dessert the other day, it has a slightly sour taste, a new taste experience. The meat is white and quite tough. One must strive to masticate it, it is almost impossible, the last bit has to be swallowed whole. We ate a hearty breakfast of porridge and eggs and it felt good to gear up for the trip. At 11:30 a.m. we left Matadi and we arrived in Kimpese by 2.30 p.m. Yapeco is our driver. After a stop at a toll, the engine didn´t start again because the battery was too weak. And because this is an automatic car, it cannot be started by pushing it off. Yapeco is prepared for many surprises, he took out his jumper cables and some guys pulled up next to us with their truck. They had to work hard to get off the battery cover, but they solved it, interconnected the cables and the engine started. While this operation was going on, we had at least ten vendors around us who eagerly offered fruit and various other things. Along the way, we could see a lot of large mango trees. There is plenty of fruit for the vendors, and it is just beginning to mature. 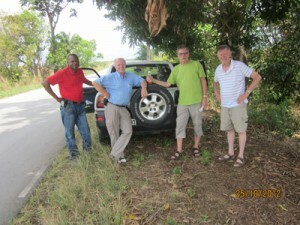 Halfway to Kimpese, we made a short stop and parked under a mango tree. It gave us the much-needed shade. We drank the Congolese soft drink Djino that I had kept by my feet. All other spaces in the car was filled to the brim. Unfortunately, we could not turn the heat off, it came in abundance and it had warmed our drink significantly, plus the fact that my legs got slightly overheated. Bernt claimed that he had never drunk such a hot soft drink before. Although the Djino was maximally heated, it quenched our thirst. 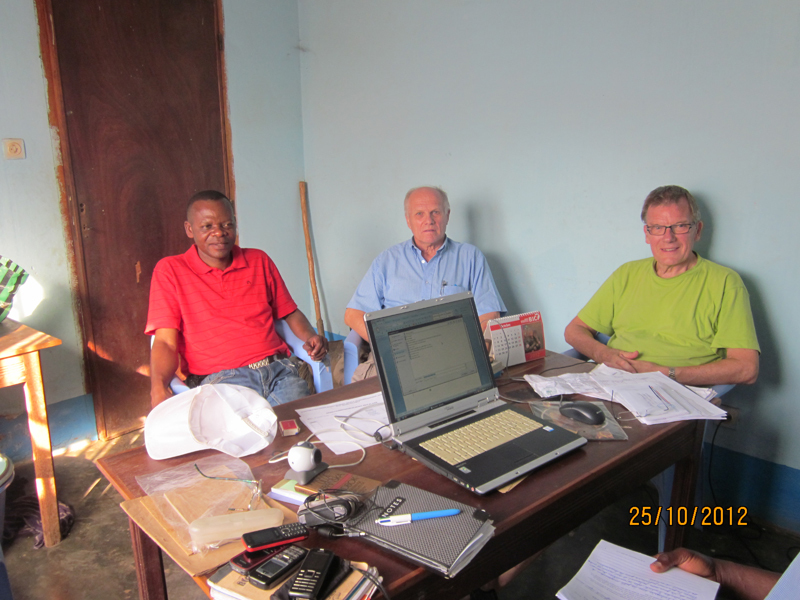 Here in Kimpese, we are staying one night with Nganga and Therese, before we go on to Kinshasa tomorrow. 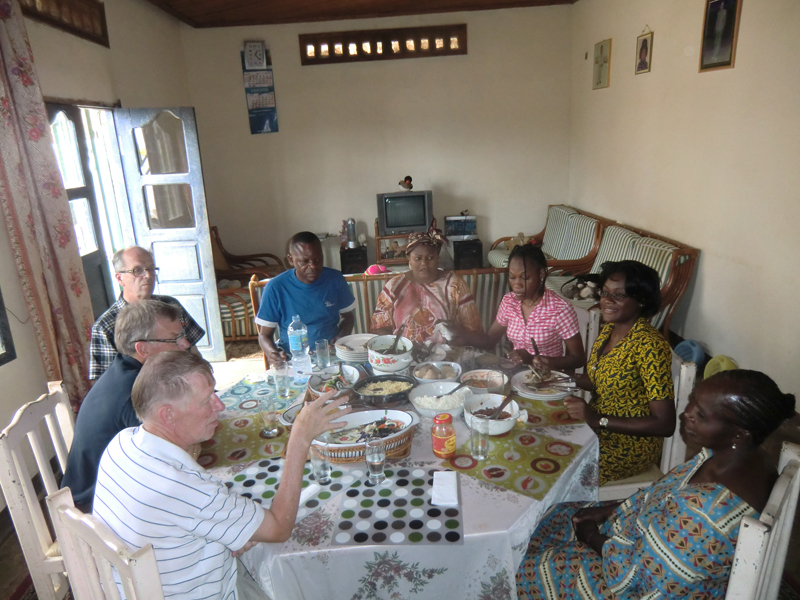 Shortly after our arrival, Thérèse served dinner. 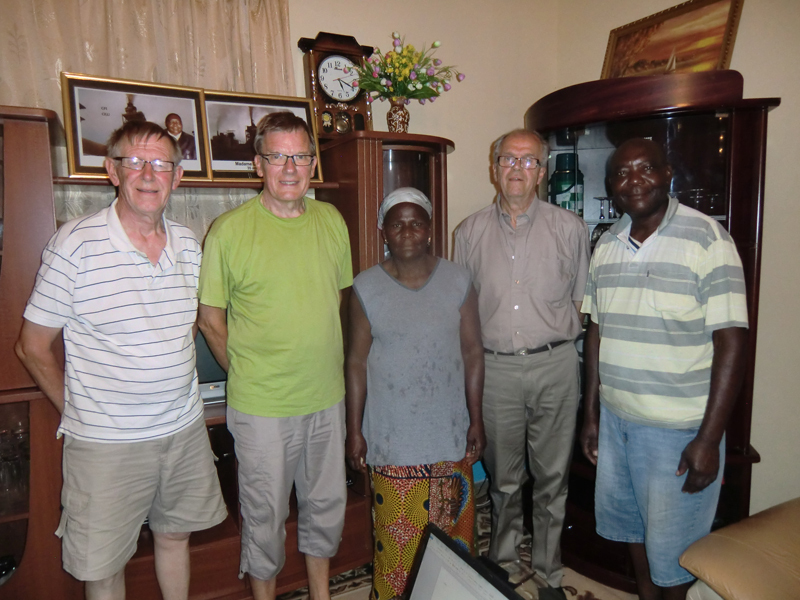 Afterwards, we visited our local representative Emy Miantezila. He told us about his activities and commitment. As I have written about before, he takes care of homeless children and gives them an education. 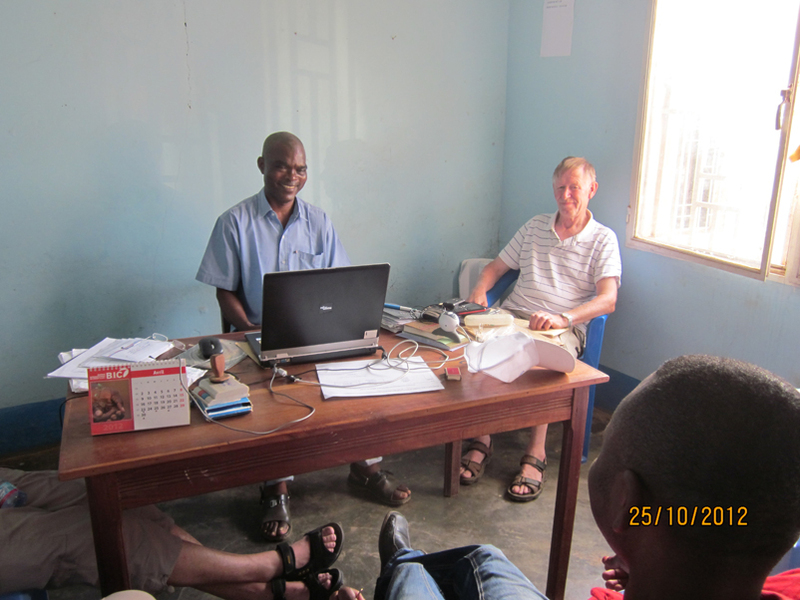 He runs a library and an Internet café in Kimpese. 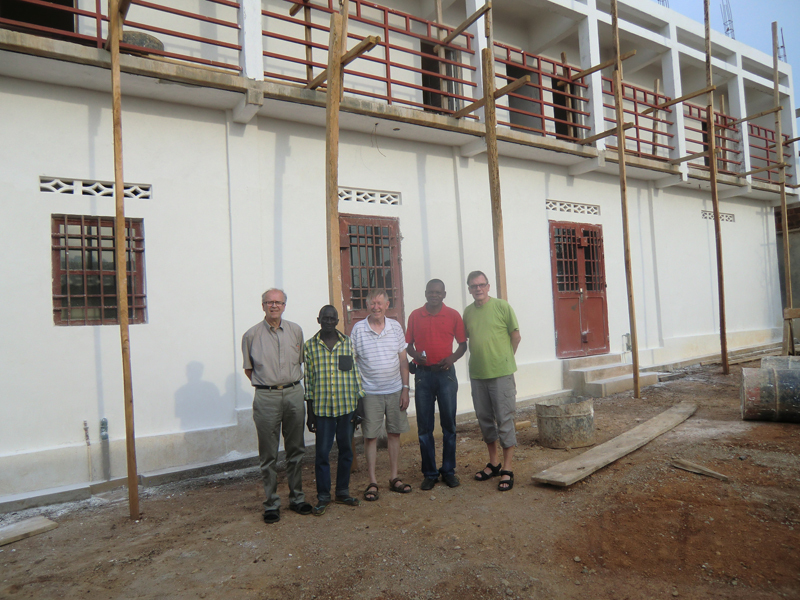 He bakes bread and he is the Chairman of the Gothia Sportcenter, a football project in Kimpese. The football project will go on for three years, and is currently on year two. 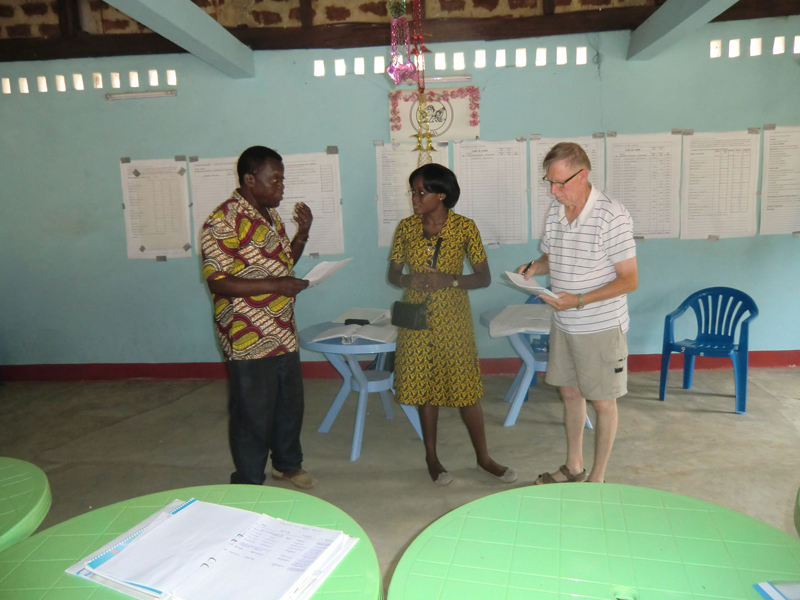 The project is funded by Sweden, but after the end of the project period, it will be funded by other means. He has an agricultural project of seven acres that creates the livelihood for families and school fees for the children. 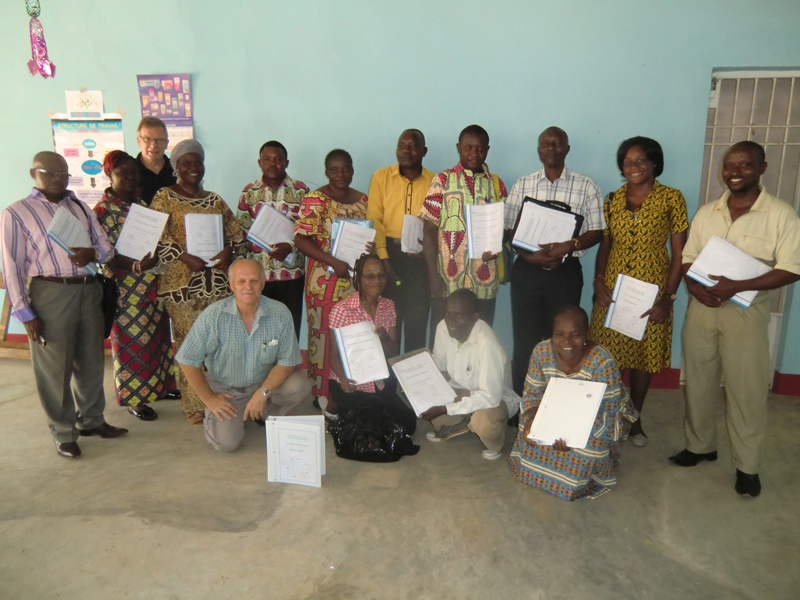 Emy had collected the reports from the Kimpese entrepreneurial course. We’ll take them and go through them eventually. Vi har läst sista bloggen “vi lämnat Matadi” och känner oss delaktiga, även om vi är på “andra sidan”. Vi sitterjustnu vid frukostbordet, efter en mycket god naturskön i våra go’a sängar hemma hos Blanche, Giscard’s syster. Vi har varit ute på en upplevelserik !! resa under 2 dagar – till Ngouedi. Vi är så otroligt tacksamma att dennaresa kunde bli av ochhar så mycket positivt att berätta för Fristadborna när vi kommer hem. Att resa genom Mayombe-regnskog (riktig regnskog!!) på en nygjord asfaltväg varen upplevelse utöver det vanliga! Kineserna är skickliga! Nu önskar vi er en GOD hemresa och en VÄLBEHÖVLIG VILA! Intressant läsa om ert arbete i Matadi, kanske bästa sättet att hjälpa Kongo komma påegna fötter.